For the past week, amateur and professional pianists have had the rare chance to tickle the ivories outdoors throughout all five boroughs of New York City. Play Me, I'm Yours is a citywide artwork by British artist, Luke Jerram, featuring 60 pianos located in parks, streets, and plazas, intended specifically for public use. Each piano is an individual work of art, painted and decorated by volunteers from local schools and community organizations, mobilized by the nonprofit, Sing for Hope. Bryant Park is happy to host a Play Me, I'm Yours piano on the front terrace of the New York Public Library, beneath the south lion statue at Fifth Avenue and 41st Street. 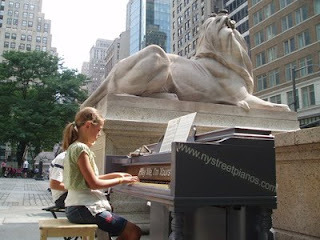 Visit www.nystreetpianos.com for a map of all the public piano locations, piano hours, and to share your comments and photographs from each site. The pianos will be available through July 4, so grab a partner and brush up on Heart and Soul en plein air. 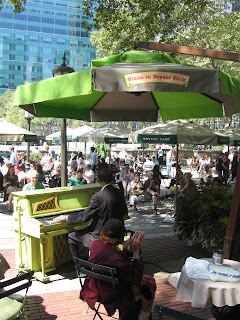 Please remember that Bryant Park's signature piano, located at the rear of the New York Public Library on the park's Upper Terrace (beneath a large green and gray umbrella), is not intended for public use. The piano was created for our Piano in Bryant Park program, in which a different musician fills the Upper Terrace with toe-tapping jazz and ragtime tunes, every weekday from 12:30pm to 2:30pm. Stop by this week to catch a performance by talented Piano in Bryant Park veteran, Todd Robbins, who plays classic tin pan alley songs, performs regularly with Woody Allen's Jazz Band, and happens to swallow swords, fire, and glass (though not in the park). Visit www.bryantpark.org for the complete roster of Piano in Bryant Park musicians. The program is generously supported by Local 802 of the American Federation of Musicians, the Music Performance Fund, and Sam Ash Music.